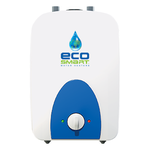 EcoSmart US® is a privately owned manufacturer of green energy technology based out of Waterbury, Connecticut. EcoSmart’s mission is to produce and distribute quality green energy products that are practically efficient and economical to consumers in the area of water heating. 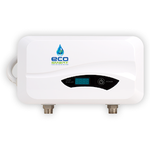 Energy consumed to heat water can account for up to 25% of the average person’s energy bill due to outdated methods such as tank storage. 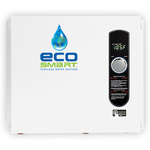 EcoSmart’s patented self modulating technology within the electric tankless water heater line can save customers up to 60% on their water heating bill as compared to a storage tank. 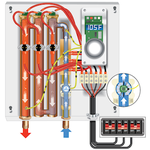 Hot water ON DEMAND is the key to conserving energy for consumers and for the environment. 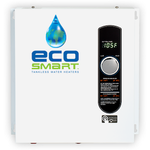 EcoSmart brings this motivation to producing a complete line of tankless technology for various applications including: Showers, bath tubs, sinks, dishwashers, washing machines, radiant heating, spa and pool. There are many different options to choose from on the market and it is important for consumers to make educated decisions on which brand is best for them. 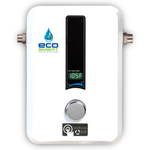 The ability to regulate the amount of energy used by the tankless water heater is the most important distinction between brands within the industry. 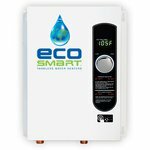 EcoSmart is on the leading edge of technology as it relates to precisely modulating energy consumption based on specific demand.